Picture yourself in an historic grand estate home from the Ringling period, remarkably refined with contemporary luxuries and amenities. The Juliar House, built by a member of the Ringling family, embraces authenticity of design in a location only a stone's throw from The Ringling, the pillar of Sarasota's arts and culture. Offering five bedrooms, this magnificent estate home is set amidst lush and tropical gardens.Updated to perfection by builder Pat Ball and architect Greg Hall, step inside to the entry hall that provides a sense of grandeur only imagined in an earlier era. Prepare dinner for family or guests in the gourmet kitchen with Sub-Zero fridge and Wolf gas range. Serve with style in the formal dining room. Infused with character, a multitude of rooms provide space for a variety of activities while providing comfort for your guests. The master suite is the pinnacle of luxury, opening to a spa-like master bath. Superb finishes and details include hardwood floors, Cotto D'Este porcelain tile, fireplace, French doors, marble floors, fine woodwork, arch doorways, crown molding, and wainscoting.The exteriors are equally opulent where you can dine al fresco under the magnificent ramada while the children enjoy the pool. The host in you will find endless options for entertaining. 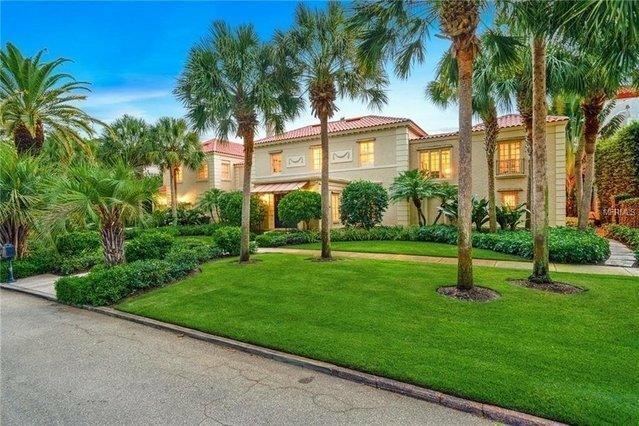 Perched to enjoy all the Sarasota area has to offer, this masterful residence is located near beautiful white-sand beaches, championship golf courses, cultural attractions, and SRQ airport.